The US crossover market is red hot right now, and there’s a growing demand for three-row crossovers for families not interested in minivans. That’s where the all-new Mazda CX-9 enters the picture, and families will be quite pleased with this latest bit of news from the Insurance Institute for Highway Safety (IIHS). The nonprofit agency has awarded the 2017 CX-9 with a Top Safety Pick+ rating, the highest score possible. The IIHS conducts rigorous testing, notably the small overlap crash test, where it received a “Good” score. 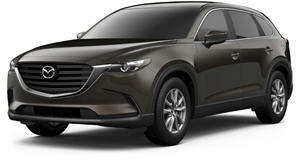 In fact, the CX-9 earned top marks in all five crash tests. Also tested was the CX-9’s emergency braking capabilities, where it received a "Good" rating. Mazda has also made available Smart City Brake Support for low-speed emergency braking and Smart Brake Support, which utilizes a radar-based system at highway speeds. One of the main goals in developing the CX-9 was "to create a vehicle that could delight couples or shuttle families with the same effortlessness. Now, we are proud to say that the IIHS has recognized CX-9 for its safety, highlighting the achievements of our engineering team," stated Masashi Otsuka, VP of R&D and design for Mazda. Other mid-size, non-luxury crossovers to have earned the Top Safety Pick+ rating include the Honda Pilot, Hyundai Santa Fe, and Toyota Highlander.